Ashkenazy Acquisition Corp. is making good on its promise to mix more fun with fashion at its Shops at Rivercenter. The developer is teaming with Merlin Entertainments to bring a pair of marquee attractions — Sea Life Aquarium and Legoland Discovery Center — to the downtown San Antonio mall. Rivercenter is carving out about 65,000 square feet of retail space for the two visitor attractions. Both are expected to open in 2018. Sea Life is one of the world’s more acclaimed aquarium brands, with more than 50 venues across North America, Europe and the Asia Pacific. San Antonio will be the second Texas city to land a Sea Life facility. Dallas is already home to a Sea Life attraction. The Sea Life venues typically display a collection of diverse marine life. 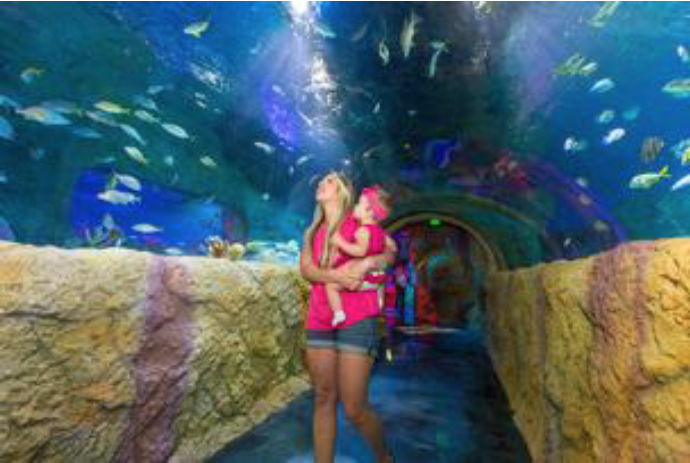 The San Antonio aquarium will include as its centerpiece a tropical ocean tank with a walk-through underwater tunnel. The Discovery Centers include a range of play areas, workshops and 4-D theaters. Merlin Entertainments’ John Jakobsen said the proximity of the Shops at Rivercenter to the San Antonio River and the Alamo — two of the state’s most popular visitor destinations — was a factor in the company’s decision to expand here.